- wondering why the mate(s) in 4 got no mention, I asked Jesper whether Elizabeth had made a mistake or "is it an incredibly subtle ruse to see if the kids are really on the ball?" - Jesper replied: "That is correct! What I do is to let the kids work two and two and their task is to find as many mates as possible in five moves. I also tell them there is one mate in 4 that gives a golden star to the team finding it. This is the best training position I have ever seen. 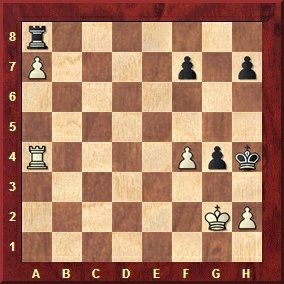 (Both Magnus Carlsen and Simen Agdestein agree ... )"
This position was "composed" by Richard Reti and published in 1921. 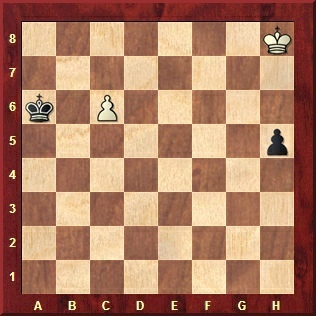 It is obvious that his king cannot catch the h-pawn, so it must promote. 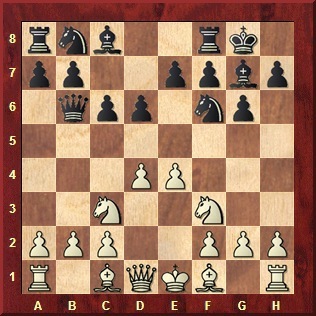 It is also obvious that his king is too far away from his own pawn to help it get to its promotion square (c8). 2...Ka6-b6 3 Kf6-e5 and 3...Kb6xc6 4 Ke5-f4 h4-h3 5 Kf4-g3 or 3...h4-h3 4 Ke5-d6 h3-h2 c6-c7. This position arose in a 1991 British Championship game, Jim Plaskett-Jonathan Parker. Black's g4 pawn was pinned by the Ra4. White has just played f2-f4. Therefore the g4 pawn is no longer pinned and could move g4-g3. BUT the g4 pawn IS still pinned, because the "en passant" capture, g4xf3 (which would normally be possible), is illegal because it would leave the black king in check. Therefore the g4 pawn is both pinned and not pinned at the same time!